For the past few years, fraternity and sorority leaders have been working together to build a positive presence in Washington that helps to protect the fraternal experience we offer to our members. The Fraternity and Sorority PAC provides financial aid to the campaigns of federal office candidates whether they be Congressional, Senatorial, or Presidential; who support the objectives of fraternity life. 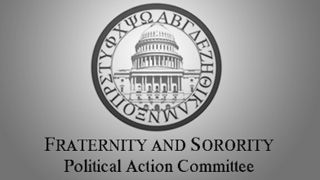 Formed on March 1, 2005, the FSPAC allows Greeks to work together to visibly support our brothers and sisters in Congress and those who champion Greek issues.